Donna Barre has worked for years as a “data geek”. 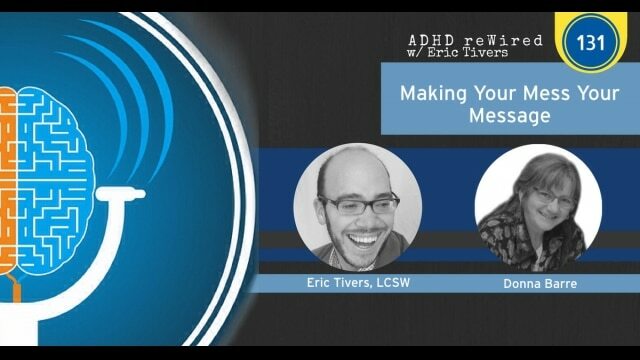 She is now re-inventing herself to help others with ADHD find meaning, joy, and the pursuit of their creative endeavors. Donna was also a member of the very first ADHD reWired Coaching and Accountability Group. Donna is doing something unique, she’s bringing arts and crafts into the world of ADHD. In this conversation, Donna talks about the importance of play and creativity and their role in productivity. She explains what art does for her and how activities like art can help in various areas of life. Email Donna to tell her you are interested in a crafting Group for ADHD. [7:16] – Donna shares her back-story and explains why she joined the ADHD reWired Coaching and Accountability Group. [9:16] – When Donna started the group, she was looking to unload some real estate and the group helped her through that process. [12:43] – Donna shares how long-term success means ongoing support and accountability. [16:21] – Donna gets sucked into entertainment such as television and the internet and she talks about how she gets herself back-on-track. [19:04] – Donna talks about her tendency to minimize accomplishments and we talk about self-correcting mechanisms and breaking bad habits. [24:25] – Donna is bringing arts and crafts into the world of ADHD. She talks about the importance of play and creativity and their role in productivity. [34:34] – Donna opens up about clutter. This is a cyclical struggle for her. [41:01] – Data is Donna’s “play”. [49:02] – Donna sits down in the ADHD reWired Hot Seat and throughout this segment, we work through her issues with confidence and bravery. Donna shares what she thinks being brave means, and what a brave Donna looks like. [1:23:12] – Fill out the contact form below to let Donna know if you are interested in her supportive crafting group.